Welcome back from your PD Day holiday! I hope you had a relaxing time. We have a big push ahead of us, so let's remain focused and on track for the next ten weeks. Today, we are going to discuss the culminating assignment (you'll also need the rubric) which is worth 15% of your final mark. We are also going to review the requirements for your on-line portfolio, and the format of your exit interview (which combined, are worth the other 15%). The is the first part of the Blockbuster booklet that you will need to finish your project. Your group should set aside Thursday and Friday to complete this activities. This is an excellent quick tutorial on how to use camera angles to help tell your story. You will need to pitch your movie before you are allowed to proceed into development and eventually, production. This handout will help you develop and fine tune your ideas. Your stop-motion animations are due today. There will be a USB key for you to copy them on to for evaluation. Please take the time to fill out this self-reflection about your work over the last three weeks. Today we are going to start a 5 week journey to complete what will be your most challenging project of the year. We are going to take ALL the skills you have learned so far, dust them off and supercharge them, as we enter the magical world of movie-making. It all starts with our exploration of the Phases of Movie Making​. We will then move on to Common Shot Techniques, which includes studying the movie below. Unfortunately, I am away from class today. I hope you all have a wonderfully relaxing March Break. But before you go, we have some work to get done! 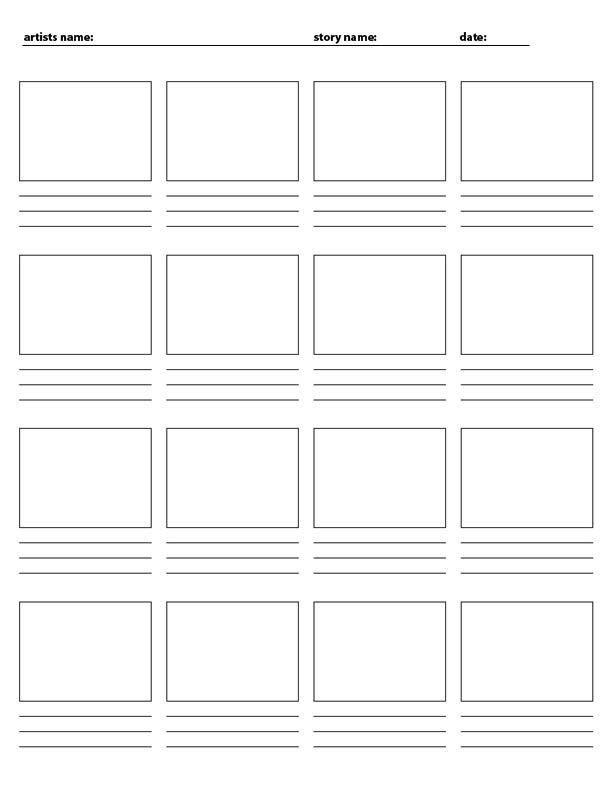 You will need this storyboard template (print as many as you need..remember you are only laying out your key frames), and plot diagram. Ideas for storytelling, even stories that are only 7 seconds long, are hard. Today, we will take some time out to look at brainstorming techniques that might help you, and also what the "professionals do". As you work on your flip books, and as we transition to creating animation on the computer, the images below (from the Illusion of Life Tumblr) will be an invaluable reminder on how you can create the illusion of life. These 12 basic principles of animation were developed by Walt Disney Studios during the 1930s. These ideas were at the forefront of exciting discoveries that were contributing to the development of a new art form. These principles came as a result of reflection about the practice of animation and through Disney’s desire to use animation to express character and personality. This gallery is a take on those principles, applied to simple shapes, like this cube. Click on each animation to bring them to life (if you hover, you can remind yourself of the name of the technique). As you continue to work on your Flip Books, let's review how we trick the mind to see the illusion of life in animation. Our task today is start using the concepts of animation that we have started to learn, by making a flip book cartoon come to life. In its most primitive form, a flip book is an actual book, and each page is a static image. The reader flips through all of the pages at an even pace, resulting in a short animated movie. The image seems to move through a phenomena known as the persistence of vision. You will be making three flip books this week, one that will animate a circle into a triangle, and then back again, another that will show motion, and then a final one that will be totally your own creation (and more complex and detailed). This handout will get you started on this assignment. We will be using the last half the period to start discussing the HUUUUGE project that will be bringing your knowledge of photography, animation and Photoshop all together. We will be starting stop motion animation!! (..bring this checklist along to help you stay organized). Today we are going to start our second unit and explore the fundamentals of animation. If this is something you really enjoy and would like to look at possible post-secondary opportunities in this field, Fanshaw is only one of many similar programs in Ontario. You can also download the freeware program Stykz and install it for practice at home (there are versions for both Windows and Mac OS). We will also be using the powerful freeware program Anim8or (which is only available for Windows computers). Check these ideas out as you start to brainstorm about what story you would like to tell and techniques you would like to use. This will be the on-line binder for the TGJ2OI class.